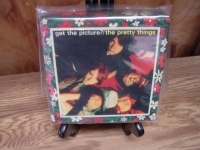 "Pretty Things, Get The Picture - OBI Box Set of 5 Minis"
PRETTY THINGS - GET THE PICTURE - Japanese OBI MINI REPLICA LP TITLES making a 5 CD Box Set- Japanese OBI MINI REPLICA BOX SET Japanese re-mastered Mini LP replica Limited Edition Collection Recorded from the finest Original Masters available. Special VERY RARE LIMITED EDITION BOX SET ONLY PRODUCED ON FUTURES FOR THIS ONE TIME PRESSING -- were only available in Japan. REPLICA LP IN A CD BOX SET INCLUDES - Limited Japanese box containg paper sleeve versions of "Pretty Things", "Get the Picture", "Emotions", "S.F. Sorrow", and "Parachute". Track Listings 1. S.F. Sorrow Is Born 2. Bracelets Of Fingers 3. She Says Good Morning 4. Private Sorrow 5. Balloon Burning 6. Death 7. Baron Saturday 8. Journey 9. I See You 10. Well Of Destiny 11. Trust 12. Old Man Going 13. Loneliest Person 14. Defecting Grey 15. Defecting Grey 16. Mr. Evasion 17. Talkin' About The Good Times 18. Walking Through My Dreams 19. She Says Good Morning 20. Alexander 21. Death Of A Socialite 22. Children 23. Sun 24. There Will Never Be Another Day 25. House Of Ten 26. Out In The Night 27. One Long Glance 28. Growing In My Mind 29. Photographer 30. Bright Lights Of The City 31. Tripping 32. My Time 33. Scene One 34. Good Mr. Square 35. Sha Was Tall, She Was High 36. In The Square 37. Letter 38. Rain 39. Miss Fay Regrets 40. Cries From The Midnight Circus 41. Grass 42. Sickle Clowns 43. She's A Lover 44. What's The Use 45. Parachute 46. Blue Serge Blues 47. October 26 48. Cold Stone 49. Stone - Hearted Mama 50. Summer Time 51. Circus Mind 52. Roadrunner 53. Judgement Day 54. Chester Street 55. Big City 56. Unknown Blues 57. Mama, Keep Your Big Mouth Shut 58. Honey, I Need 59. Oh Baby Doll 60. She's Fine She's Mine 61. Don't Lie To Me 62. Moon Is Rising 63. Pretty Things 64. Rosalyn 65. Big Ross Man 66. Don't Bring Me Down 67. We'll Be Together 68. I Can Never Say 69. Get Yourself Home 70. You Don't Believe Me 71. Buzz The Jerk 72. Get The Picture? 73. Can't Stand The Pain 74. Rainin' In My Heart 75. We'll Play House 76. You'll Never Do It Baby 77. I Had A Dream 78. I Want Your Love 79. London Town 80. Cry To Me 81. Gonna Find A Substitute 82. Get A Buzz (Bonus Track) 83. Sittin' All Alone (Bonus Track) 84. Midnight To Six Man (Bonus Track) 85. Me Needing You (Bonus Track) 86. Come See Me (Bonus Track) 87. L.S.D. (Bonus Track) These are Japanese digitally re-mastered Mini LP replica CDs (the OBI Edition). This Limited Edition Collection has only VERY FEW made world-wide and are immediately Out of Print. Recorded from the finest Original Masters available. Comes with anti-static sleeves similar to Vinyl LPs, Cardboard packaging like an LP, includes extensive Liner Notes Booklet. Actual miniaturized version of the 12inch LP in 4inch CD version.